Tagging allows the user to assign her own (words/phrases/labels) metadata to each resource in the form of tags. help managing AWS resources & services for e.g. instances, images, security groups etc. help categorize AWS resources in different ways, for e.g., by purpose, owner (Developer, Finance etc), or environment (DEV, TEST, PROD etc). be used as a mechanism to organize resource costs on the cost allocation report. Tags can be assigned only to resources that already exist and cannot be assigned when you create a resource; for e.g., when you use the run-instances AWS CLI command. However, when using the AWS Management console, some resource creation screens enable you to specify tags which are applied immediately after the resource is created. defining a new tag that has the same key as an existing tag on that resource, the new value overwrites the old value. keys and values can be edited, removed from a resource at any time. value can be defined as an empty string, but can’t be set to null. IAM allows you the ability to control which users in your AWS account have permission to create, edit, or delete tags. Common examples of tags are Environment, Application, Owner, Cost Center, Purpose, Stack etc. Do not use the aws: prefix in the tag names or values because it is reserved for AWS use. Tags with this prefix can’t be edited or deleted and they do not count against the tags per resource limit. Tags allowed characters are: letters, spaces, and numbers representable in UTF-8, plus the following special characters: + – = . _ : / @. Public or shared resources can be tagged, but the tags assigned are available only to the AWS account and not to the other accounts sharing the resource. Resources with tagging restrictions of None can be tagged with API actions, the CLI, and the console. Tags can be used as a mechanism to organize the resource costs on the cost allocation report. Cost allocation tags can be used to categorize and track the AWS costs. When tags are applied to AWS resources such as EC2 instances or S3 buckets and activated in the billing console, AWS generates a cost allocation report as a (CSV file) with the usage and costs aggregated by active tags. Tags can be applied so that they represent business categories (such as cost centers, application names, or owners) to organize costs across multiple services. Fill in the blanks: _________ let you categorize your EC2 resources in different ways, for example, by purpose, owner, or environment. 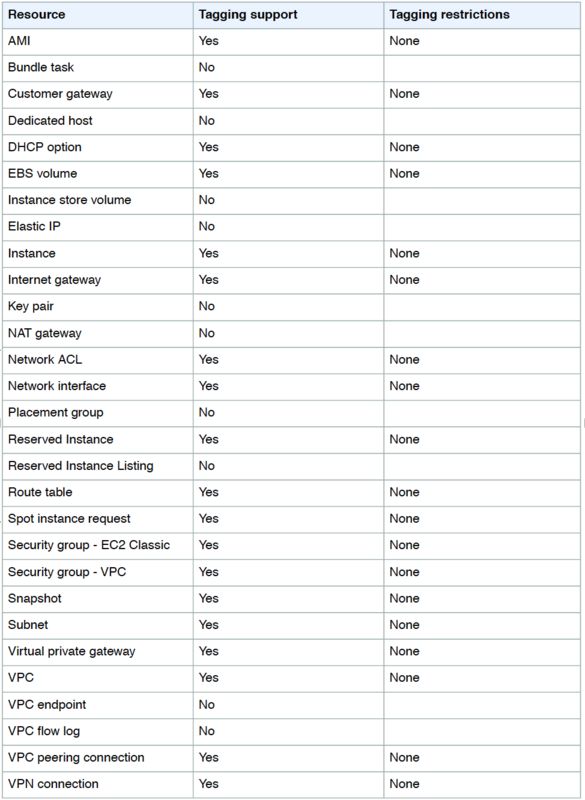 Please select the Amazon EC2 resource, which can be tagged. Can the string value of ‘Key’ be prefixed with aws:? An organization has launched 5 instances: 2 for production and 3 for testing. The organization wants that one particular group of IAM users should only access the test instances and not the production ones. How can the organization set that as a part of the policy? A user has launched multiple EC2 instances for the purpose of development and testing in the same region. The user wants to find the separate cost for the production and development instances. How can the user find the cost distribution? An organization is using cost allocation tags to find the cost distribution of different departments and projects. One of the instances has two separate tags with the key/value as “InstanceName/HR”, “CostCenter/HR”. What will AWS do in this case? Your system recently experienced down time during the troubleshooting process. You found that a new administrator mistakenly terminated several production EC2 instances. Which of the following strategies will help prevent a similar situation in the future? The administrator still must be able to:- launch, start stop, and terminate development resources. – launch and start production instances. What is the maximum number of tags that a user can assign to an EC2 instance?